It's Christmas in Mega-City One! Well at least that what you would gather on the is December 1982 issue of White Dwarf. The cover, an article, an editorial and at least three and half pages of ads are devoted to the new game from Games Workshop, Judge Dredd. 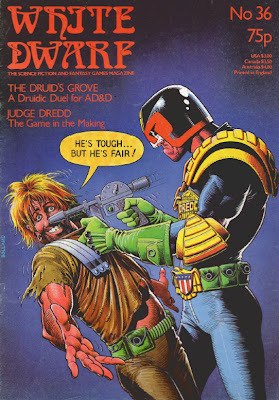 It was through White Dwarf in fact that I first learned about Judge Dredd. So to me this seemed like a "comic book" game. Jumping ahead, Ian Livingstone introduces us to the new game in the editorial. He also mentions that we will see more RPG material in 1983. The article on Dredd talks about the design of the game. Or rather an introduction to Judge Dredd and what process the author and designer, Ian Livingstone (ah..see how that worked out) went through to make the game. The process is actually not all that different than what we still do, or even what I did when working on Buffy and Ghosts of Albion. I would have to say the game was a success since a.) it introduced me to Judge Dredd, b.) I remember people being very, very excited about it back then, and c.) I still catch people talking about it today. What else does this issue feature? We have an odd ad of the magazine "Pssst! ", which only lived for less than a year I think. So odd that I didn't even know what it was for till I found the name off in the corner. Fiend Factory is up, but only has one monster, the Loculi. It is like an 8-legged, sword wielding ankylosaurus. It's stats improve with age (like a dragon) and there is a lot things you can play around with with this creature. Unlike the dragon though I don't find it interesting enough to want to use it. Andy Slack is up with an Introduction to Traveller. Part 1 is about players and characters. I have mentioned that this about the time of my decline in interest in Traveller. I still enjoyed reading about it, but I never did much more than that. Letters is a fun bunch this time with people coming to Ken St. Andre's defense over Don Turnbull's letter in #34. I didn't post anything about that here, but I really should have. Turnbull felt that T&T was nothing more than a rip off of D&D. People this month choose to disagree. Next month also promises to be good. Microview is back and in this month Mike Costello has two BASIC Traveller programs. 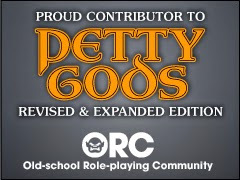 He also mentions how greaat it would be to have a character creator software for RuneQuest or D&D. The programs are simple, but you have to type them out. I remember typing in EVERY program I saw in a magazine just so I had the practice of doing it. I don't recall if I ever did these on my trusty TRS-80 Color Computer 2, but I am sure I tried them out on my Jr High's TRS-80 Model 3s. These programs would have worked on the built in BASIC of the Model 3 (or was it Model III), since it had a Zilog 80 chip. Our AD&D contribution is The Druid's Duel by Mark Byng. I remember being quite excited about this since I was playing a druid at the time and gave this to my DM at the time and told him he now had something for my duel before I can advance in level. Never went through it though. Open Box has some reviews of classic products. Nicholas J R Dougan gives The Warlock of Firetop Mountain a 10/10. Up next is a product I really wanted back in the day and should see if I can find it. Tollpak was all about playing Trolls in RuneQuest, but honestly you could port the ideas over to any game that has trolls. It was one of the first "revisionist" books (and I say that with a bit a hesitance, "revisionist" has such negative connotations and I don't mean that here.) We would see something similar for Orc/Orks in Orkwrold and eventually even goblins and kobolds. But this was the first. Tim Moyse gives it a 9/10. We also have Pirates of Plunder (10/10) and some long out of print Traveller books from FASA; Merchant Class Ships (8 or 7/10), Aslan Mercenary Cruisers (6 or 8/10), and The FCI Consumer Guide (9 or 8/10) ranked for Novices and Experts. 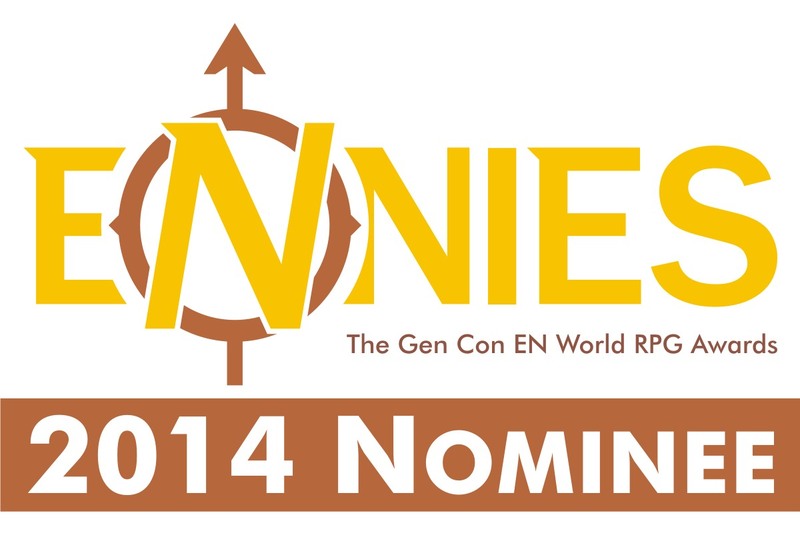 Simon Early has some Rules Additions for RuneQuest as this month's RuneRites. Mostly realted to SIZ and climbing. 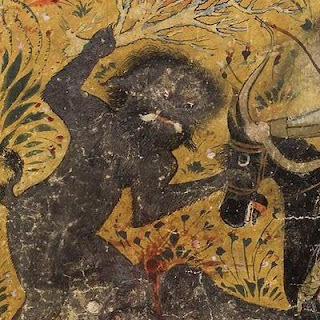 Lew Pulsipher wraps up his A Guide to Dungeon Mastering with Part III: Some Conclusions. Mostly this is advice on how to deal with high level characters. Not to beat a dead horse here, but this material still works today. This is another one of my choices for my own "Best Of White Dwarf". Treasure Chest has More Necromantic Abilities for the Necromancer of the last issue. A couple of pages of ads. Nothing interesting in the classifieds. As an aside: Did anyone use classifieds in a magazine to find other gamers? Did it work? Have any good stories? A contest to win your very own Mattel Intellivision Advanced Dungeons & Dragons video game cartridge. The first six correct entries to their quick quiz will win. Deadline December 15, 1982. 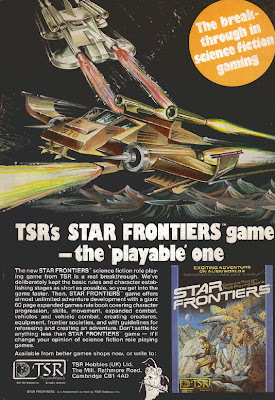 A few more pages of ads and finally another ad for Star Frontiers. Described by the ad as "the 'playable' one. Certainly a dig at Traveller. Remember when the future was silver lamé and hot pants? Well now it is big sunglasses/goggles. I remember that spat between Turnbull and St Andre (although I don't remember Ken actually getting involved in it but his supporters certainly did). Even if Don didn't like T&T and believed it to be a D&D rip-off, there was no reason to weigh in so vocally; he could have kept his opinions to himself. Perhaps he felt it was part of his job to 'defend' TSR products. All it ended up doing was eroding any respect I might have had for him.